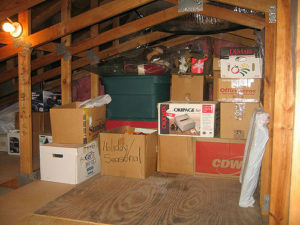 It’s nearly spring and that means it’s time for an attic clean out to reclaim precious space. There are a number of attic clean out tips and tricks you can use to make it go a bit smoother and get better results. Few homeowners really think about their attics as truly useful spaces. Most tend to think of these spaces as dark, dingy places where old family heirlooms and season decorations reside year after year. But, an attic can serve an entirely different purpose. Your attic might currently be home to Christmas house clutter, where decorations, ornaments, and more are tucked away. It might also be full of boxes stuffed with long forgotten possessions. But, it doesn’t have to remain a storage space. You can actually transform your attic to be a useful living space. Not only will this provide you with more livable square feet, you’ll also be increasing the value of your property. Clear a pathway. Before you start emptying items out of the attic, be sure to clear a walkway so you don’t have to negotiate obstacles time and again. It’s best to have a clear pathway without any tripping hazards. Move any furniture and let others know what you’re doing. Identify everything. After you have established a clear path, you’ll need to identify everything in the attic. This is going to constitute the bulk of your efforts and will take the most time to complete. Label all boxes with contents so you know what is what and where. Remove all the junk. Once you’ve identified and labeled things, it’s time to purge the junk from the attic. You’ll need to set aside any packrat compulsion and be totally open to paring down on possessions. If you don’t use it or don’t really need it, get rid of it. Formulate a workable plan. Next, come up with a plan. This will depend on what you’d ultimately like the space to be used for — such as a game room, spare bedroom, or making it into a new master suite. When it’s time to do an attic clean out, phone us at 800-433-1094 or visit Junk Garbage Removal. Our crew can help clean out your attic so you have more space for storage or to transform.